Young Rembrandts started many years ago, long before I understood the impact learning to draw has on a child’s ability to do art and how essential it was to visual learners. I started teaching ‘Bette’s Art Classes’ as a favor to a friend. As an artist myself, I understood how much I had longed for ‘how to’ instruction. My experience working with children helped me develop a teaching method that met children at their level of readiness and encouraged them to stretch beyond what they thought was possible; all while teaching children the fundamentals of drawing, basic art terminology and techniques and opening them up to consider things they had not yet encountered. Eventually Bette’s Art Classes became Young Rembrandts. Young Rembrandts is now a franchise company that teaches children how to draw in after-school programs all across the U.S. and Canada and we’ve started to spread our wings internationally. Every week 30,000 – 40,000 preschool and elementary age children spend time drawing, learning and creating with us and through the miracle of technology and social media, I get to see the delight on their faces and the incredible work they produce. And if all that’s not enough – after years of seeing our student’s progress, talking to teachers and parents – I realized there are things happening in our classes that goes far beyond the art. In the fall of 2012 my first book, Being Visual: Raising a Generation of Innovative Thinkers, was published. 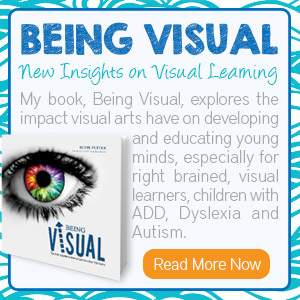 It’s a book about how we learn and think, with a focus on right-brain visual thinking and the essential role art plays in preparing visual children to be successful in the academic classroom. All the research, evidence and my own observations led to the same conclusion – that learning to draw, doing art, participating in the arts – was enormously significant in the lives of visual- spatial thinkers. I have been enormously blessed to spend my career making art and helping children learn to make art. And I was delighted to find out that all the years and all the thousands of remarkable people involved in Young Rembrandts, have made a profound impact in children’s artistic abilities and their success in the classroom.